If you're all about comfort dressing when it comes to your personal style, you'll love this incredibly chic pairing of a light blue denim jacket and a natasha couture lace faux fur embellished clutch black. Bring instant glamour to your outfit with black leather mid-calf boots. If you're obsessed with practicality dressing when it comes to fashion, you'll love this seriously chic pairing of a black coat and a natasha couture lace faux fur embellished clutch black. Lift up this ensemble with black leather ankle boots. If you're all about relaxed dressing when it comes to your personal style, you'll love this incredibly chic combination of a grey coat and a natasha couture lace faux fur embellished clutch black. Perk up your ensemble with black suede pumps. We all want comfort when it comes to dressing up, and this combination of a light blue denim jacket and a natasha couture lace faux fur embellished clutch black from Nordstrom is a good illustration of that. A pair of black leather mid-calf boots will add some real flair to this outfit. 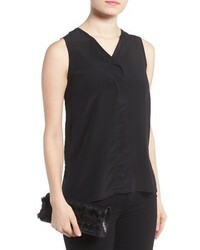 If you're a fan of relaxed dressing when it comes to your personal style, you'll love this seriously stylish pairing of a black long sleeve t-shirt and a natasha couture lace faux fur embellished clutch black from Nordstrom. Up the cool of your getup by rounding it off with black suede pumps. If you're a fan of functionality dressing when it comes to fashion, you'll love this stylish pairing of a camel coat and a natasha couture lace faux fur embellished clutch black. You could perhaps get a little creative when it comes to footwear and dress up your outfit with black chunky leather ankle boots. We're all seeking comfort when it comes to dressing up, and this combination of a black crew-neck sweater and a natasha couture lace faux fur embellished clutch black from Nordstrom is a great illustration of that. Up the cool of your look by complementing it with black cutout leather ankle boots. Try pairing a dark brown leopard fur coat with a natasha couture lace faux fur embellished clutch black to be both neat and relaxed. 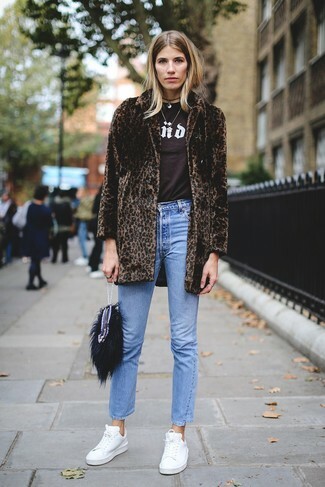 When it comes to shoes, this look is round off well with white leather low top sneakers. Wear a camel coat with a natasha couture lace faux fur embellished clutch black for a casual get-up. Choose a pair of black suede over the knee boots to va-va-voom your outfit.